Rare Pictorial Journey of Indian Independence. Total No. of Pages -182, Total No. of Photographs - 200. Description of "Indian Independence Journey (eBook)"
1857 Revolt, Freedom Struggle, Freedom Fighters and 1947 Independence through Rare Pictorial Journey of 150 years old & real Black & White Photographs & Paintings of Historical Heritage. Total No. of Pages -182, Total No. of Photographs - 200. About Author: - Anurag Mathur (B.Sc., M.A. - History, PhD Level Research, Post Graduate Diploma in Hotel & Tourism Management Advance Course in Tourism from IITTM – Indian Institute of Tourism & Travel Management- Ministry of Tourism Govt. of India, New Delhi & WTO (World Tourism Organization). PGDBIM (MBA-Delhi). Ex. Lecturer of History, Hotel & Tourism Management Department at Agra University. Agra & also Numismatist (Coins Collector), Philatelist, Antiques, Rare Photographs & Paintings Collector etc, Lucknow. U.P. India. (Father of Author Anurag Mathur, Late. Shri. O.N. Mathur, Archaeological Survey of India (ASI), Govt. of India -Posted at Taj Mahal & other Historical Monuments at Agra-1975 - 89. Author Anurag Mathur’s forefather was posted at Royal Imperial Court of Emperor Shaha Jahan as Finance Minister (Treasury Incharge –Shahi Khazana) as per Author’s Family Tree Records & generations Chronology & rest all ancestors were educated from Kayastha family and served in Royal Mughal Court after one by one. - - Indian Culture & Heritage Information, Lucknow. 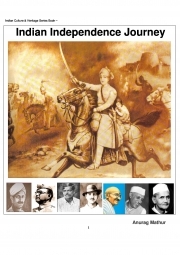 Reviews of "Indian Independence Journey (eBook)"